Let’s now see how to trade the news with a directional bias in a trading scenario. Let’s go back to our example of the U.S. unemployment rate report. Earlier, we gave examples of what could happen if the unemployment report came in light with expectations, or slightly better. In this scenario, let’s say the unemployment rate showed a surprising DROP. Which is a good thing since that means more people now have jobs. But you look at your charts and the dollar is FALLING! Isn’t the dollar supposed to rise if the unemployment rate is dropping? There could be a couple reasons why the dollar could still fall even though there are more people with jobs. The first reason could be that the long-term and overall trend of the U.S. economy is still in a downward spiral. Remember that there are several fundamental factors that play into an economy’s strength or weakness. Although the unemployment rate dropped, it might not be a big enough catalyst for the big traders to start changing their perception of the dollar. Perhaps it’s right after Thanksgiving during the holiday rush. During this time, many companies normally hire seasonal employees to keep up with the influx of Christmas shoppers. This increase in jobs may cause a short term drop in the unemployment rate, but it’s not at all indicative of the long-term outlook for the U.S. economy. A better way to get a more accurate measure of the unemployment situation would be to look at the number from last year and compare it to this year. This would allow you to see if the job market actually improved or not. The important thing to remember is to always take a step back and look at the overall picture before making any quick decisions. Now that you have that information in your head, it’s time to see how we can trade the news with a directional bias. Let’s stick with our unemployment rate example to keep it simple. The first thing you would want to do before the report comes out is to take a look at the trend of the unemployment rate to see if it has been increasing or decreasing. By looking at what has been happening in the past, you can prepare yourself for what might happen in the future. Imagine that the unemployment rate has been steadily increasing. Six months ago it was at 1% and last month it topped out at 3%. You could now say with some confidence that jobs are decreasing and that there is a good possibility the unemployment rate will continue to rise. Since you are expecting the unemployment rate to rise, you can now start preparing to go short on the dollar. This is your directional bias. Particularly, you feel like you could short USD/JPY. Just before the unemployment rate is about to be announced, you could look at the price movement of USD/JPY at least 20 minutes prior and find the range of movement. Take note of the high and low that is made. This will become your breakout points. 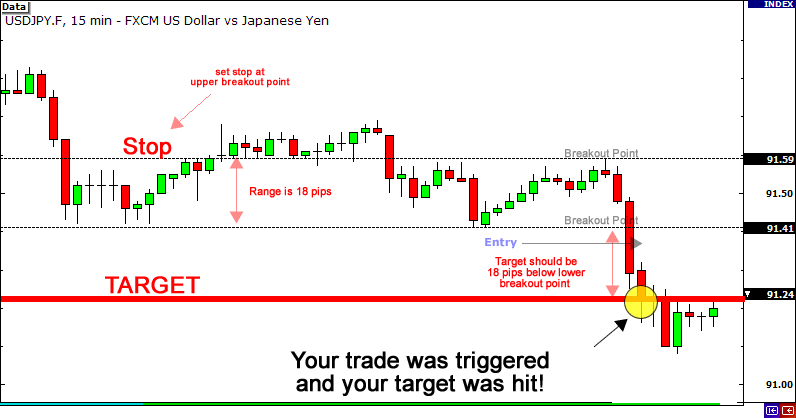 The smaller the range, the larger the tendency there is for a volatile move! Since you have a bearish outlook on the dollar (your directional bias), you would pay particular attention to the lower breakout point of that range. 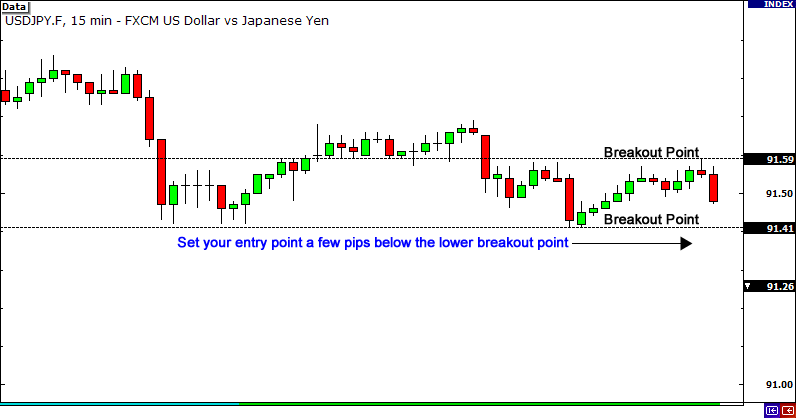 You are expecting the dollar to drop, so a reasonable strategy would be to set an entry point a few pips below that level. 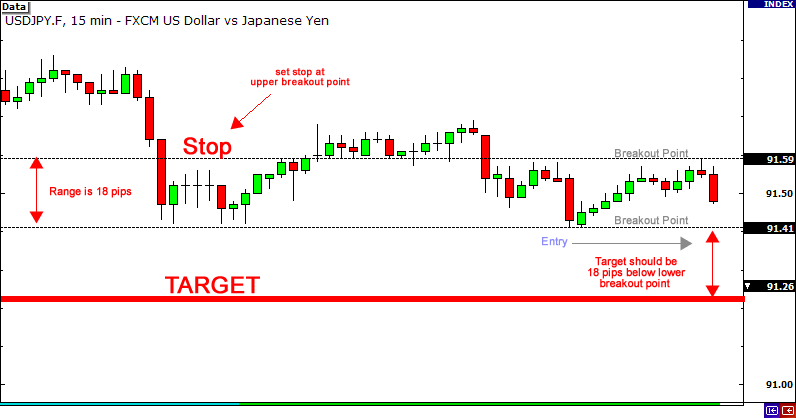 You could then set a stop just at the upper breakout point and set your limit for the same amount of pips as the breakout point range. One of two things could happen at this point. If the unemployment rate drops then the dollar could rise. This would cause USD/JPY to rise and your trade would most likely not trigger. No harm no foul! Or if the news is as you expected and the unemployment rate rises, the dollar could drop (assuming the entire fundamental outlook on the dollar is already bearish). This is good for you because you already set up a trade that was bearish on the dollar and now all you have to do is watch your trade unfold. Later on, you see that your target gets hit. You just grabbed yourself a handful of pips! Booyeah! The key to having a directional bias is that you must truly understand the concepts behind the news report that you plan to trade. If you don’t understand what effect it can have on particular currencies, then you might get caught up in some bad setups.